It seems a long time since NO's excellent Don't Worry You'll Be Here Forever EP, released late in 2011, and a follow-up single What's Your Name, but as El Prado clearly demonstrates it's been time well spent perfecting their debut album El Prado. Those familiar with the EP will be delighted that the album more than delivers on the promises of that record and then some. What's clear immediately is that there's no radical change of direction from the EP. The shimmering guitars, drums deep in the mix and Bradley Hanan Carter's vocals take centre stage right from the start of opener Leave The Door Wide Open and don't leave you to the last bars of closing track Go Outside. For a six-piece they don't make a huge sound on record (live they're a different proposition), preferring a more considered approach that allows the emotion in the songs to pour out of the speakers and envelop the listener and the huge hooks in most of the tracks to pull you in. They manage that fine trick of sounding intimate, like they're addressing you personally, whilst the songs could fill big arenas if you turn the guitars and drums up. It's something they work across the album, from the four songs from Don't Worry (Stay With Me, There's A Glow, Another Life and The Long Haul) to the newer less familiar material, which demonstrates more of a song-writing progression than a revolution. Songs such as North Star and Hold On don't have the immediacy of the older songs and have a slower build whilst they burrow into your conscience, but lack none of the intimate power of their predecessors. As a result, there's no obvious stand-out tracks because of the quality across the whole record. There's been comparisons to The National, and whilst they're kind of valid in the sense that they're American, they write intelligent, angst-ridden accessible songs, it's important to state, given you may be reading this and thinking exactly that, that there's far more to NO that dismisses any copyist accusations. NO are spending most of March and April trekking across the States, where they're starting to pick up momentum including a recent performance on Carson Daly's Last Call, but it's hoped that they'll come to the UK and play to wider audiences than their two previous trips. 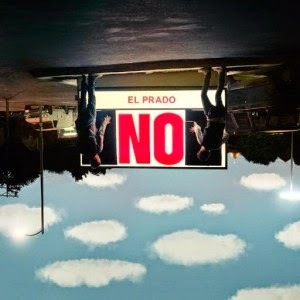 El Prado is a formidable debut album and on the basis of it, it's time to say a big YES to NO. NO's official site can be found here. They are also on Facebook and Twitter. The album can be purchased in the UK via Amazon.